Welcome to the May 2011 Contest Giveaway Entry Page. To enter, all you have to do is post a hunting tip and a picture or two if you have them. If you want to win free hunting stuff you have come to the right place. Enter our free contest to have a chance to win. Simply fill in the form with your hunting tips for your chance to win. 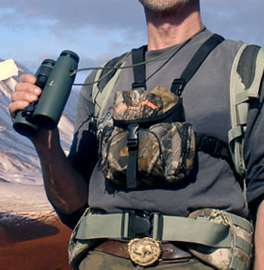 The May 2011 Contest Giveaway is a Binocular Chest Pack. This chest pack is the brainchild of renown Alaskan Hunting Guide Jaret Owens. The Alaskan Guide Creations Bino Chest Pack is a product that has been developed over a period of thirty years. This is the "Original Chest Pack" that all the others are being modeled after. Jaret designed, used and modified the chest pack to what it is today. A quality, made in USA product that you would be proud to wear and very happy to have on your shoulders. If you have ever suffered from a sore neck from carrying binoculars or have had trouble keeping your binocular lenses clean, then the Alaskan Guide Creations Bino Chest Pack is for you. All our contests are absolutely free... no cost to you... No money anyway. You will however, have to write your entry. Note: All entries will be checked for appropriate language and content before they will be posted. This month's contest entry is Any Animal Hunting Tips. All you need to do is supply a meaningful hunting tip. Write it as though you were telling someone who has never heard of this great game getting tip before. Write a story around it, explain how you have used this hunting tip to harvest your game. Watch our Facebook Page for future contest giveaway announcements. Prizes will be awarded randomly, anyone can win. Tell your friends about this contest, click the like button and make a comment too! We would love to hear from you. Fill in the title: Example, Whitetail Deer Hunting Tip or Bear Hunting Tip. Whatever animal you have chosen to give the tip about.Then write your tip. We promise not to use your email address for anything other than to notify you that your entry has been accepted. We will not share email addresses with anyone or any company. Steve entered a Game Recovery hunting tip, check it out. Thanks to all who participated in this contest, and congratulations Steve. African Hunt of a Lifetime for Father and Son!